Ryther is a center that provides psychiatric and mental health services for children and youth. 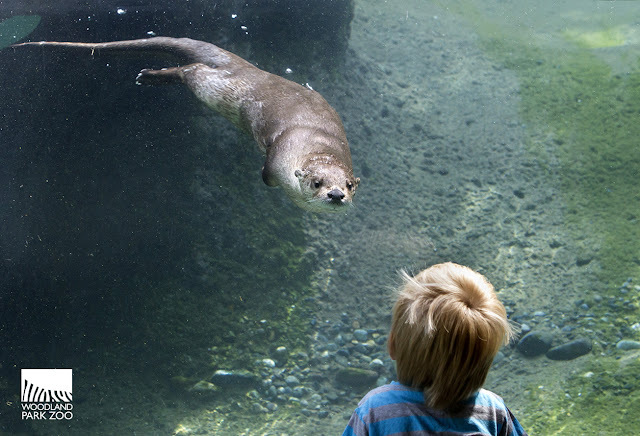 Just about 15 minutes away from Woodland Park Zoo, Ryther has been bringing kids to the zoo for over 25 years through the zoo’s free Community Access Program. These are the kids most in need of community and Ryther is one of the best kept secrets in our neighborhood. 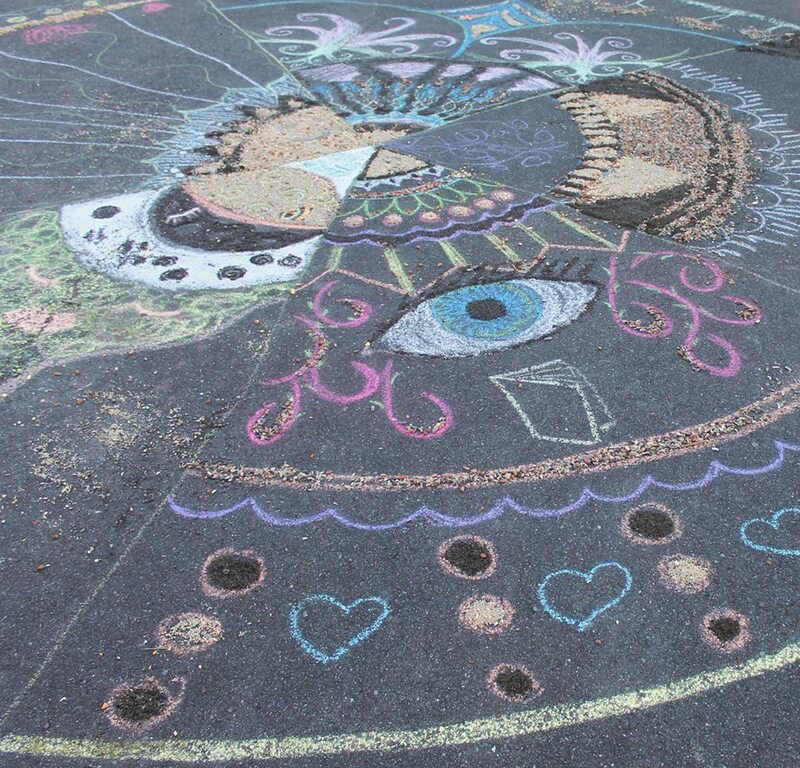 They take in some of the most vulnerable children in the Puget Sound and beyond. At Ryther, kids are never turned away. Today Ryther works with the most complex kids. Their mission is augmented by the generosity of the community, their dedicated volunteer base, the Ryther League, from large donations and sponsors to tickets from local institutions such as the Seattle Aquarium and Woodland Park Zoo. This is a story about the kids in the Cottage Program. Ryther is just one of over 600 Community Access Program partners in the Seattle area and beyond. The zoo’s Community Access Program works with hundreds of organizations such as Ryther to make the zoo more accessible to low-income, at-risk or underserved children and families. Why? Because we believe time spent with wildlife is educational, motivational and restorative. Something as simple as a visit to the zoo can have a profound impact on the lives of these amazingly resilient kids. Counselors bring small groups of children to the zoo to experience time away from the cottages, to connect with animals and nature, to experience their community and to create peaceful, safe and fun memories. Special thanks to Robin Bennett and Janelle Simms for their time and support in telling this story. Photo by Dennis Dow, Woodland Park Zoo. Thank you to Ryther for sharing their zoo memories with us, and thanks to our zoo visitors, members and the community for making this partnership possible. In addition to the Cottage Program, Ryther offers families and children a suite of outpatient services such as individual and family therapy, drug and alcohol assessments and treatment, teen and young adult co-occurring program for mental health and substance abuse, group therapy, aspiring youth camps and year round social skills groups for youth with autism spectrum disorders/ADHD/ development delays as well as autism assessments and diagnostics. If you know a child or family who might benefit from these services, you can visit www.ryther.org or call Ryther at (206) 517-0234 to speak with them today. Spring has officially arrived, and it’s brought baby fever with it; giraffe baby fever to be specific! Like many zoos around the country, we are eagerly awaiting the arrival of a giraffe calf after confirming earlier this year that 8-year-old Tufani is expecting her first baby. With a gestation period of 14 to 15 months, we're expecting a tall delivery anywhere from mid-May to early July 2017. So, what does it take to keep a pregnant Tufani comfortable and healthy? Lead keeper, and giraffe doula, Katie Ahl gives us the scoop on a few tricks of the trade. Tufani (left) with her nephew Misawa in 2013. The father is handsome 4-year-old Dave of course. This will be the first baby for both parents who were paired under a breeding recommendation made by the Giraffe Species Survival Plan (SSP), a conservation breeding program to ensure genetic diversity and demographic stability. Along with aunt Olivia and mom and dad, the baby giraffe will eventually share the savanna with zebras, gazelle and ostrich. You can help provide top notch care for expecting Tufani, and other African Savanna animals, by purchasing items from Woodland Park Zoo’s “baby shower” gift registry on Amazon: www.zoo.org/registry. 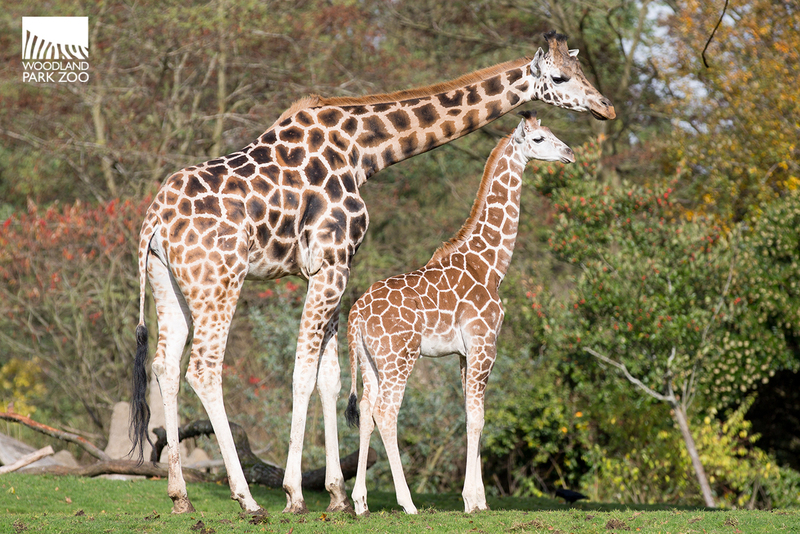 Bucket lids, chew balls and a molasses lick...what more could a pregnant giraffe (and her dedicated keepers) ask for? Visit the baby giraffe registry www.zoo.org/registry. Your generous in-kind gift can qualify as a tax-deductible contribution. Please include your name, address and email in the "Gift Message" field when checking-out so we can send you a tax receipt and say thank you! For tracking purposes, please forward your purchase confirmation to donations@zoo.​org. If you're as excited about this news as we are, then you'll be pleased to hear that we will be sharing updates on Tufani and crew right here as soon as we have more news to share. 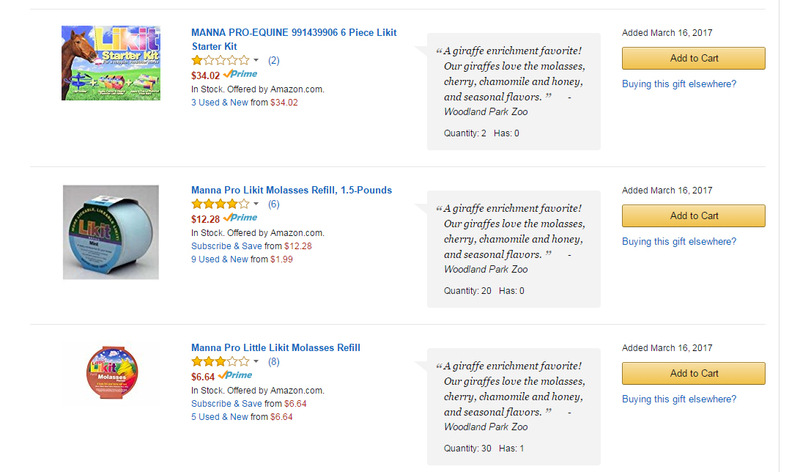 Thank you for showing your love for giraffes and all African Savanna animals. Celebrate the African savanna and the amazing animals that live there. This full day of activities focuses on migration patterns of African animals, educational keeper talks and special enrichment sessions to heighten awareness about issues such as illegal poaching and habitat loss, and how your choices and actions can help save giraffe, lions, ostrich and other critical savanna animals. 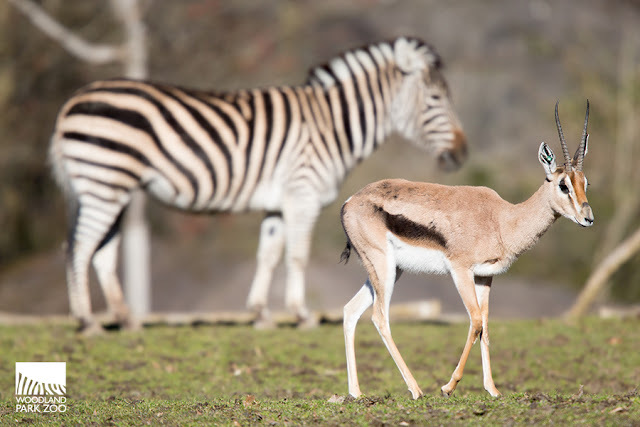 Gazelle and zebra in the mixed species African Savanna exhibit. Handsome pup! 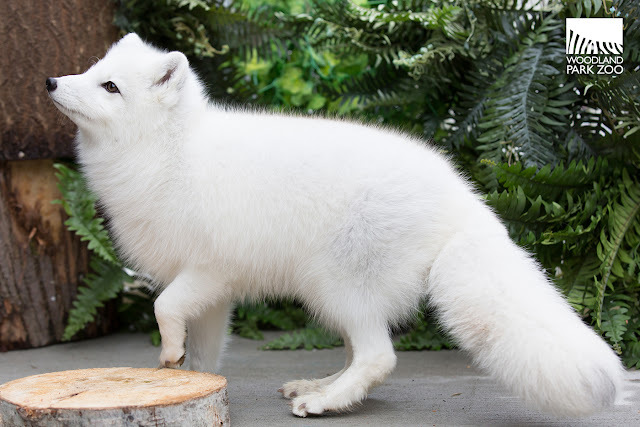 Hudson, an arctic fox and Woodland Park Zoo ambassador animal, shows off his finest pose. 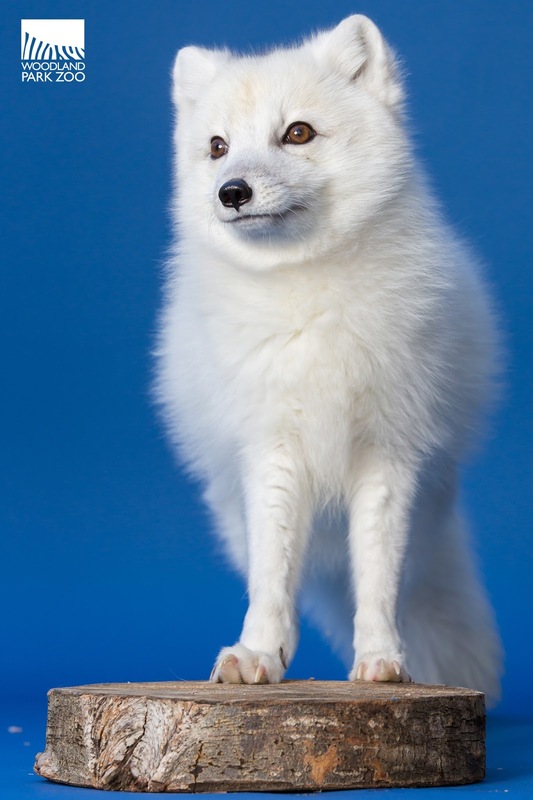 When it comes to enchanting creatures, it’s hard to find a more charming species than the arctic fox. Seemingly pulled straight from a fairy tale, these captivating canines are incredibly tough and inhabit some of the most frigid habitat. 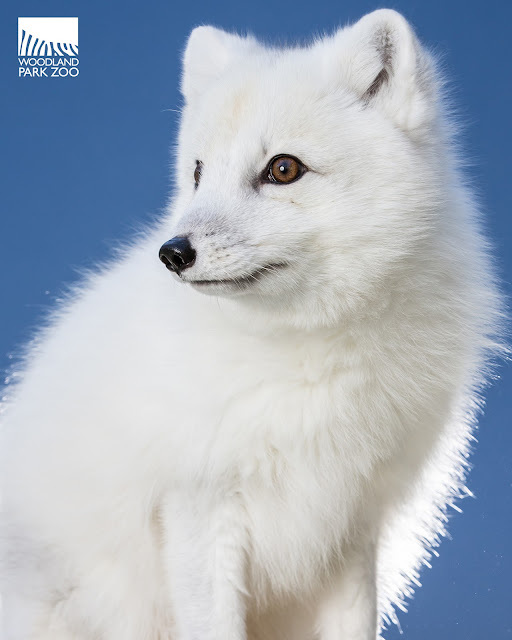 One little fox in particular is already getting quite a lot of attention as his handsome mug graces the cover of our Spring membership magazine, MyZoo. Starting this spring, and even more-so this summer, you'll have the opportunity to meet a host of incredible creatures during our Ambassador Animals programs at the Alvord Broadleaf and Wildlife theaters. Depending on how his training goes, Hudson will be one of them, giving guests the chance to see some of his awesomely Arctic adaptations such as leaping, pouncing and being entirely silent on his padded paws. 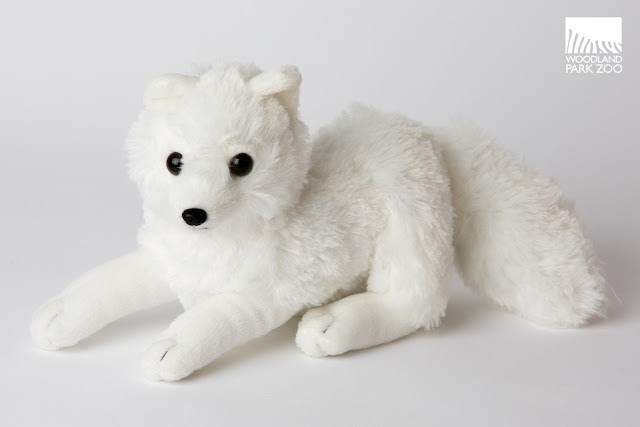 Resourceful, energetic and smart, this fox can adapt to any season and extreme environments. In the wild, arctic foxes are opportunistic and omnivorous feeders; they will eat virtually anything edible. Small mammals make up their preferred summer diet, but they also eat plants, bird eggs, insects and fish. Winter diets include marine mammals, birds, seals, invertebrates and carrion. They also eat berries and seaweed. We asked Regina Smith, one of Hudson's dedicated keepers and trainers, to give us the scoop on this little snowball. Favorite things: Heavy duty dog squeaky toys, cardboard paper towel rolls and lightweight cardboard boxes (that have squeaky toys hidden inside). Favorite treats: Dog kibble, mixed veggies (except one*), silverside fish and meatballs! Favorite activity: Sneaking up on his keepers and then running away at top speed when we try to catch him. Where does Hudson hang out when he is not visiting with guests or training? If Hudson is not participating in a training session, he is usually curled up in one of his outdoor runs keeping an eye on what zoo staff and volunteers are doing. Hudson most often chooses to sleep next to a small stump. 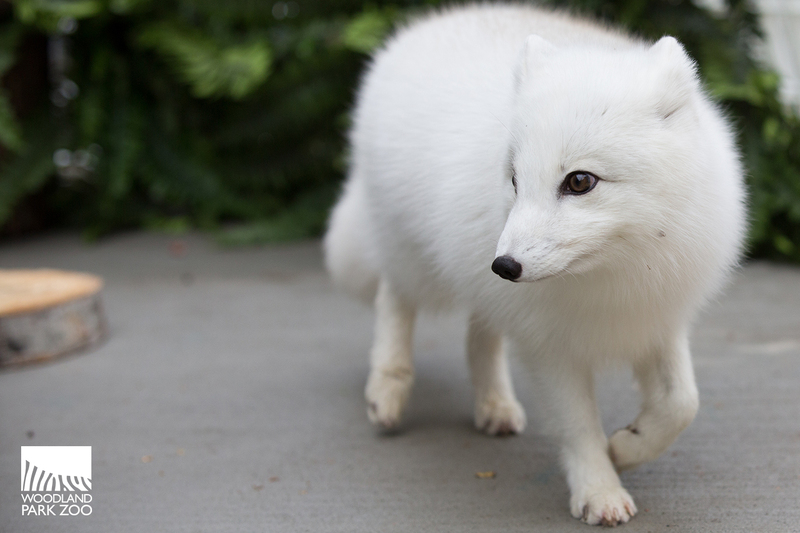 Arctic foxes have extremely long and bushy tails that muffle the sounds made by their bodies crossing terrain. They also have incredible hearing and wide, front-facing ears, which allow them to locate the precise position of their prey beneath the snow. When an arctic fox hears its next meal under the snowpack, it leaps into the air and pounces, breaking through the layer of snow right onto the prey beneath. Tell us a bit about Hudson: As an Ambassador Animal, Hudson does not live on exhibit; his role will be to give zoo guests the opportunity to have an up-close encounter with an arctic fox and hopefully an opportunity to watch him do some natural behaviors during a stage program. Hudson is very playful, intelligent, and is always ready to interact (aka have fun) with his keepers. He seems shy at first with new people, but quickly warms up to them— especially if they have treats for him! Is he especially bonded to one of his keepers? That’s a hard question! I think I have the closest relationship with him, but it may be due to the fact that I was able to work with him when he first arrived. Hudson does well with all his keepers, but when we are asking him for new behaviors or ones that make him more nervous, he is more willing to try them with me. What type of training has he received? As you will see, Hudson is a smart fox and a quick learner. He responds to target and clicker cues and can play follow-the-keeper or stand on a scale to be weighed. 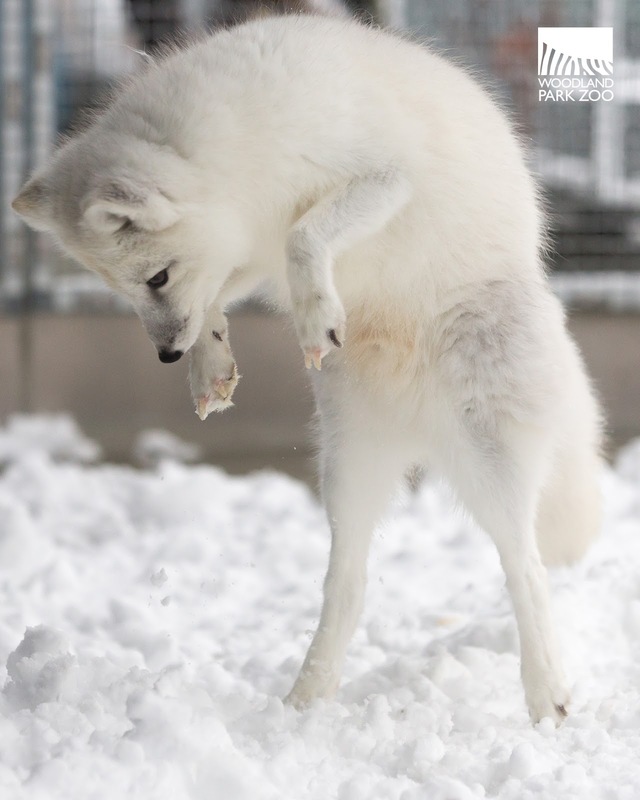 He loves to show off his signature arctic fox pounce! Does he hang with any of the other Ambassador Animals? Hudson’s neighbors are Edna the chicken, Skyáana the porcupine, Lucy the raccoon, Calvin the opossum and Blueberry the hornbill. While many mammals hibernate during the winter, the arctic fox remains active throughout the frigid months. Their physical characteristics of superb insulation with fur and fat, combined with a stocky body shape enable the arctic fox to conserve body heat. During winters, their densely furred paws prevent heat loss through their feet. They appear, and disappear, into the snowy landscape. This seemingly magical creature, beloved by many and celebrated in indigenous folklore around the North, is a reminder of nature’s incredible ability to thrive. This summer, you'll get a chance to meet Hudson and learn about his wild counterparts and their amazing ability to live in some of the harshest landscapes on earth. Snow day! 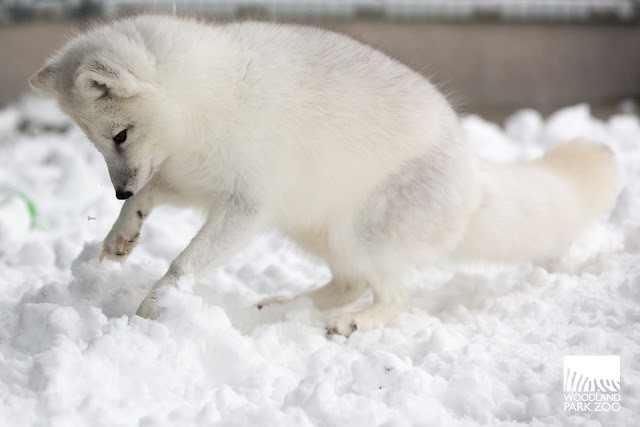 Winter wonder: Arctic foxes have a tremendous tolerance for cold. Their metabolic rate only starts to increase at -58° Fahrenheit and they only start to shiver when temperatures reach -94° Fahrenheit! You may already know that temperatures in the arctic fox’s native range are rising at twice the rate of the rest of the globe. Reduced sea ice, melting permafrost and rising sea levels are all signs of a warming trend in the Arctic. These trends threaten all species who make their home on the ice including polar bears, wolves, narwhal, walrus, whales, caribou, many sea birds, plankton and the arctic fox. The good news is that you can do something about it just by making small changes at home. Look for ways to reduce your carbon footprint by consuming sustainable resources, educating your family and friends about eco-friendly solutions for transportation and travel, adjust your thermostat, buy local, plug in compact florescent bulbs and unplug your gadgets! These small actions may seem simple, but just think, if each WPZ member household did just one action a month, that would be 43,000 steps closer to a healthy arctic landscape. Special thanks to our generous donors for their support of the Alvord Broadleaf Theater and Wildlife Theater. Ambassador Animals and raptor programs made possible by support from: Rick and Nancy Alvord, Al Buckingham, Chevron Corporation, The Hanlon Family, Ben and Ginny Holtman in memory of Jack Holtman, Kenneth and SaSa Kirkpatrick, Darinee and Scott Louvau, D.V. & Ida McEachern Charitable Trust, Julia and Adam Ryan, The Sunderland Foundation and anonymous. Thanks to our generous donors, you'll be seeing more of Hudson in our Ambassador Animals programs this summer. Over the years, guests have watched the impressive flying and hunting skills of birds of prey at the zoo’s Raptor Center. This summer, a diverse cast of ambassador animals will be added to the up-close, animal experience, Earn Your Wings, including pot-bellied pigs Annabelle and Bailey along with a rotating cast of guest appearances by flamingo chicks Paco and Pluma, arctic fox Hudson, raccoon Lucy, a skunk and others. Seating at the new Wildlife Theater will triple in a newly renovated visitor viewing area, better vistas will be offered and the sound system will be enhanced. The new Friends by Nature program at the Alvord Broadleaf Theater offers zoo-goers an opportunity to meet a variety of ambassador animals including a hornbill, porcupine, and kookaburra through engaging, up-close experiences that incite empathy and the desire to take action for wildlife. If you just can't wait to meet Hudson, you can always adopt a ZooParent in his likeness. When you make a symbolic adoption, your gift directly supports conservation efforts at the zoo and around the world. Don't get pinched! This Saint Patrick's Day, make sure you are green inside and out. Take this quiz to see where you land on the zoo's green'o'meter. 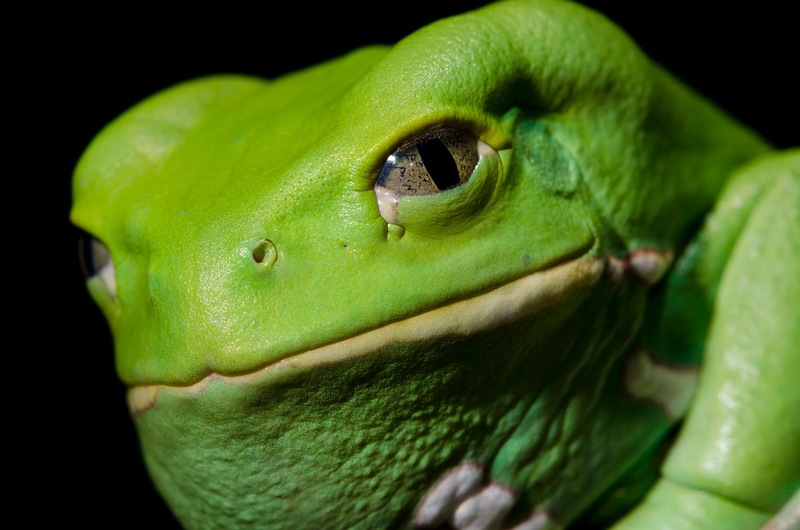 Are you as green as a waxy monkey frog? Photo by Ryan Hawk/Woodland Park Zoo. Misho gets a pre-operation inspection from veterinary staff. Say hello to Misho the chuckwalla, a member of our Woodland Park Zoo family since he arrived here in 2000. Chuckwallas are lizards native to the southwestern US and northern Mexico, typically measuring a little over one foot in length. Like many plant-eating reptiles, they enjoy basking on rocks in the sun and eating leafy greens. At 25 years old, Misho is certainly getting up there in age. And recently keepers noticed he hadn’t been feeling all that well. Misho at the zoo's animal hospital. Reptiles like Misho certainly aren’t known for being the most emotive creatures, and he can’t exactly tell keepers what’s wrong. So how can keepers tell when a lizard isn’t feeling himself? “It has to do a lot with posture and behavior,” explains Dr. Kelly Helmick, Woodland Park Zoo veterinarian. Healthy and happy chuckwallas spend a lot of time basking, raising themselves up off the rock a just bit. “If he’s flattened out on the rock—if he’s not basking and his color changes and he’s sitting there with his eyes closed—that’s what lethargy looks like in a lizard,” said Dr. Helmick. Which was exactly what keepers noticed in Misho. Our animal health team stepped in to give Misho a diagnostic exam: listening to the heart and lungs, taking blood samples, and feeling his abdomen. And that last test is when the vets felt something that should not have been there. Radiographs soon confirmed what the vets could feel: Misho had grown himself a giant bladder stone. 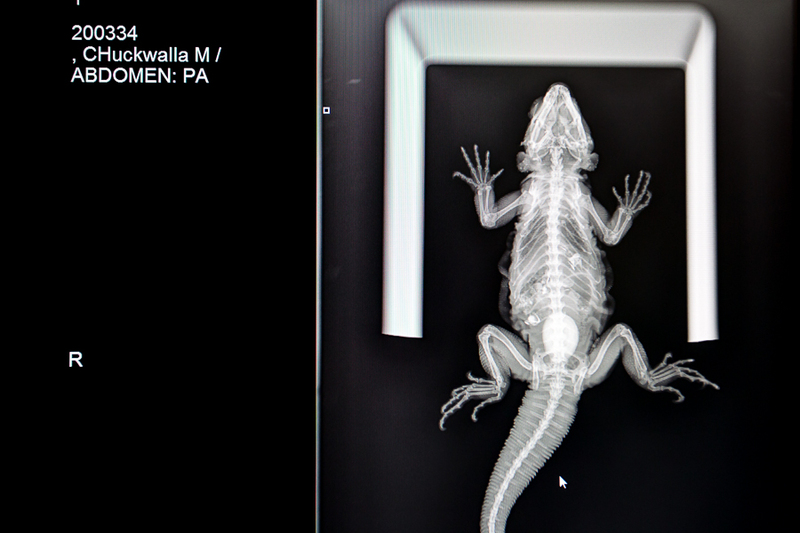 “That’s a really big stone...in a very small lizard,” recalled Dr. Helmick after her first look at the radiograph. Misho's radiograph. The stone can be seen clearly just above his tail, between his hind legs. The stone, it would later turn out, weighed just shy of six grams and most likely took months to years to build up. For a critter that weighs in at a mere 220 grams (less than 1 pound), six grams is hardly a trivial addition: it accounted for nearly 3% of his entire body weight. To put that into human terms, the average US adult would have a four to five pound rock nestled conveniently inside their bladder. “And that’s probably why Misho didn’t feel well,” said Dr. Helmick. “As the stone shifted around, it made him uncomfortable,” she said. The stone was clearly affecting his day to day quality of life, and it was clear it had to go. Several weeks later,Misho is resting comfortably inside of a warm, roomy incubator in the animal health building, presurgical antibiotics, fluids, and analgesics administered, awaiting his now imminent surgery. 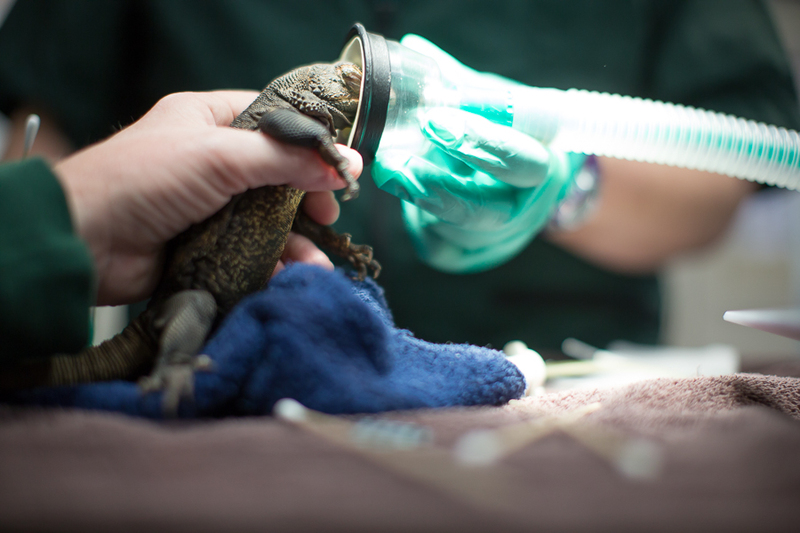 Anesthetizing lizards isn’t easy, and as the surgery gets underway, Misho isn’t proving to be an exception. They can go minutes without breathing, making it harder for the gas to take effect. That, plus our reptilian friend’s size also makes inserting a critical breathing tube challenging. Misho is so small, in fact, that no one manufactures a breathing tube small enough to fit; vets on staff custom-make their own out of other materials for him and others his size. 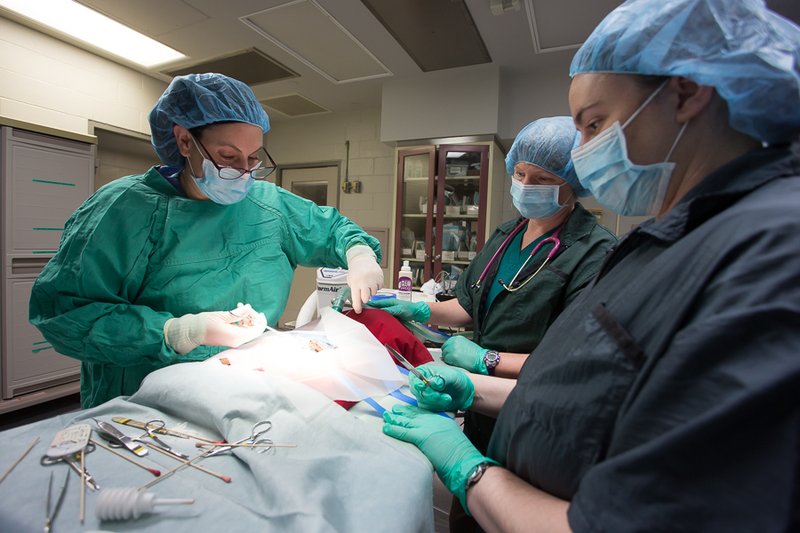 Vets hold up Misho as they administer anesthesia. “Everything about this surgery is miniature. Some of the things we need for surgery and anesthesia just aren’t made that small. So we adapt and make our own,” said Dr. Helmick. After a tense stretch of thirty minutes, the customized tube settles in and the anesthesia begins to take full effect. Dr. Helmick makes an incision, and after a little bit of searching, finds the stone. Luckily it easily pops out, and Misho loses six grams. “The stone was even larger than I expected,” said Dr. Helmick. Dr. Kelly Helmick, left, stitches up Misho after removing his bladder stone. Misho recovered well enough that he was discharged the next day back to his behind-the-scenes home, temporarily relocated from the Day Exhibit after the December 2016 fire. One thing remains a reassuring constant for Misho: rejoining his 16-year-old daughter and companion, Dembi. As Misho continues to recover in the coming weeks, keepers and vet staff will keep a close eye on him to make sure he’s feeling well. Among climate scientists and activists there is clear consensus that climate change is a global crisis and urgent action needs to be taken. As the most recent Intergovernmental Panel on Climate Change report indicates, there is no time to waste if we hope to limit global temperature increase to 1.5 degrees Celsius. Given this urgency, we are confident that the Seattle Youth Climate Action Network is needed now more than ever. 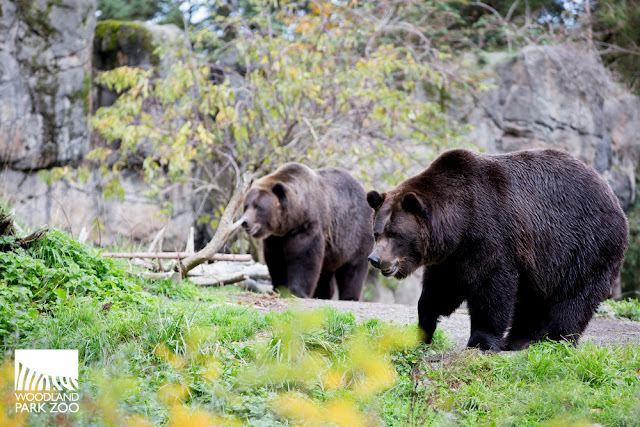 Since 2015, Woodland Park Zoo has focused our efforts to address climate change on working with youth and community partners through the Seattle Youth Climate Action Network (CAN). Seattle Youth CAN empowers teens to address climate change in their communities through education, leadership and action. Through this project, Woodland Park Zoo convenes community support for youth to gain the skills and confidence needed to become leaders in the continued fight for a better future for people, animals, and planet earth. When we developed the idea for Seattle Youth CAN in late 2014 with a group of passionate ZooCorps teen volunteers, we were responding to the call for tangible opportunities for youth to take action to address climate change. After several years of supporting and facilitating climate change focused engagement activities at the zoo, our teens were ready to lead by example and action to reduce their carbon footprint, in addition to encouraging our zoo visitors to do so. Two year later, close to 500 teens have participated in Seattle Youth CAN events, trainings, and our annual Climate Action Summit. We are proud of our progress and of the many teens and community supporters who have helped shape this exciting new project. With two years of funding from The Ocean Project to pilot this program, support from the zoo’s education department, and commitment from Seattle Aquarium and Pacific Science Center (our two founding partner institutions) we have developed a model for local collaboration in support of youth-driven climate action and leadership. This year we are continuing to grow the project, and are working to make the network accessible and relevant for all youth in the Seattle area. Seattle Youth CAN has the potential to be the regional hub for youth climate engagement and action, and is also a model that can help inspire a national youth climate movement. This project has been a great experiment in local collective impact for the zoo and our community partners (see my full report on The Ocean Project Blog), and we continue to learn as a community about supporting youth driven action and working across sectors for conservation-focused youth development. The past two summers, teen leaders developed and led an action campaign focused on getting peers to make transportation choices that reduce CO2 emissions. During the 2016 summer challenge, over 100 teens participated in events, social media and a team transportation challenge by logging 7,513 miles not driven alone which equals 3,214 pounds of CO2 saved! 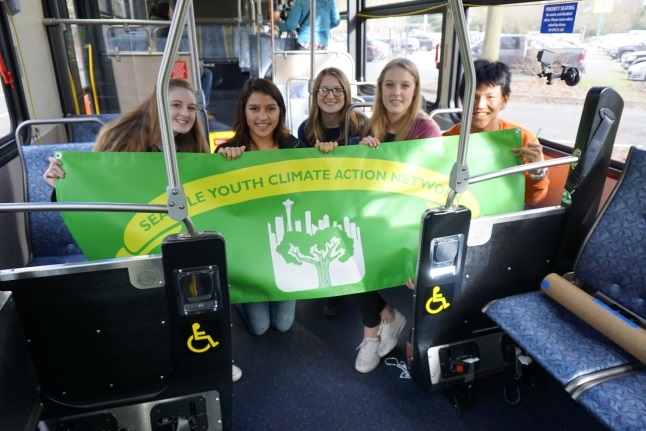 On a related note, in early 2016, teen project leads worked with King County Metro on a campaign to encourage youth to consider public transit and make the connection between public transit and fighting climate change. From this project, Metro produced a range of online resources including this video. 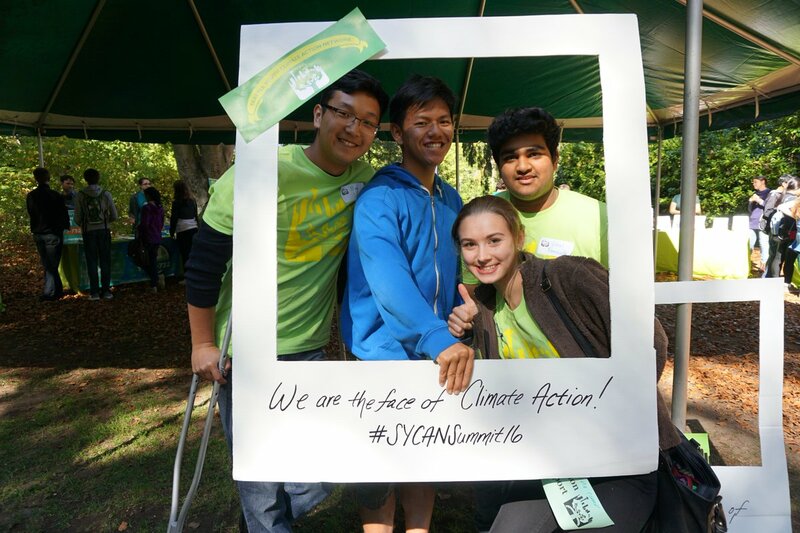 Soon after, a team of 11 teen leaders helped to organize the 2nd annual Youth Climate Action Summit at the zoo. The summit was held at Woodland Park Zoo and 100 youth participated, representing a wide range of schools and youth programs. We also had support from many of our community partners and local climate experts and activists, both in leading workshops and participating in the Climate Action Fair. Throughout the day, youth attendees had opportunities to connect with peers from around the region and engage with local climate leaders. This is an exciting time for the project and we have been busy gathering input from youth participants and community stakeholders to help us focus future programming on opportunities that are relevant and inclusive of all youth from our diverse community. In 2017, we plan to build on our successes with monthly events, opportunities for youth driven action, and our annual Youth Climate Summit. This year we will be forming a community steering committee to ensure that we have broad support for the project from both youth leaders and partners. In addition, we will be piloting a month-long Summer Learning Program for Seattle teens focused on climate literacy and careers, and hope to create paid internship opportunities to increase our capacity to support youth leadership and training. Our youth are ready to take action and lead their communities on a more sustainable future path. Please join us in our journey as we work on regional solutions to tackle on of our planet’s greatest challenges. Woodland Park Zoo and our partners are able to provide this program for youth in our community with generous support from our donors. To learn more about how you can support this program please email Kim Callahan, Annual Giving Officer, or call 206.548.2547. Teens! For monthly email updates on events and opportunities to get involved with Seattle Youth CAN please sign up here or join our Facebook group. Supporters! To keep up with our exciting progress you can follow us on Instagram and Twitter. In 1973, two very special creatures had just arrived at Woodland Park Zoo. The pair of dwarf crocodiles were just 5 years old when they settled into what would become their swampy Seattle home. 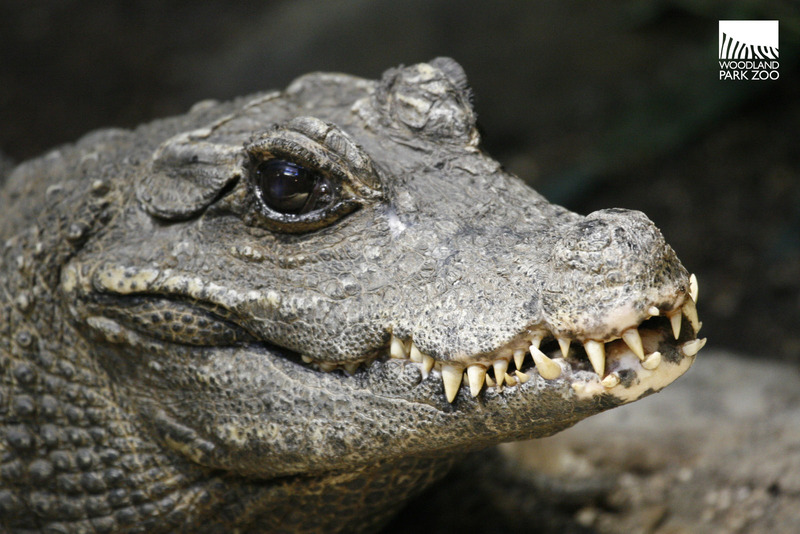 The calm, cool and ever-chill crocodiles became iconic residents of the Day Exhibit, greeting visitors with their toothy grins for over 44 years. 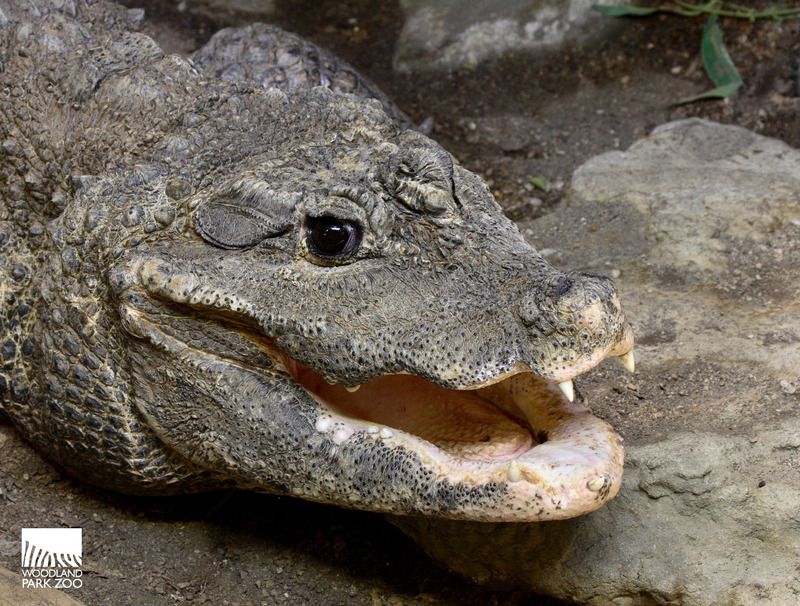 The unmistakably toothy grin of a dwarf croc. Photo by Kirsten Pisto, Woodland Park Zoo. If you were one of those visitors, you might recall them basking under the heat lamp in their grotto or catching a treat or two during Sunday feedings. But more than likely what you remember is a feeling of Zen. Simply being in their presence often inspired visitors to slow down and relax. Now, at 49 years old, the pair has embarked on a new adventure, retiring where many Americans choose to spend their golden years: sunny Florida. While we may have shed a few tears at the thought of them leaving (not crocodile tears, mind you), we are confident that their new home at St. Augustine Alligator Farm Zoological Park is the perfect spot for these amazing crocs to spend the rest of their lives. In honor of their big move, let’s look back at their time in Seattle, see what it takes to move two crocodiles across the country, and catch up on how they’re doing in their new digs. With lots of crocodile smiles (a crocodile can go through about 3,000 teeth in its lifetime), sharing of snacks (mice, rats, chicks and quail), and a love language all their own (the male lets out a really low growl, typically with his throat submerged in the water, causing the water to vibrate vigorously while water droplets begin to dance on the surface), our pair of dwarf crocs have been inseparable. The crocodiles have produced 14 babies and their offspring have moved to zoos as far away as South Africa. Our beautiful girl. You may remember that the female dwarf croc is significantly smaller than the male. At 40 pounds, she is almost a quarter of our 175 pound male. Photo by Dennis Dow, Woodland Park Zoo. Our handsome dude. The male is actually pretty big, even for a dwarf croc. At 6.3 feet long (average male is 4-5 feet) he is easy to tell apart from the female. Photo by Dennis Dow, Woodland Park Zoo. The crocodiles have always been standouts among the zoo's herpetology residents. 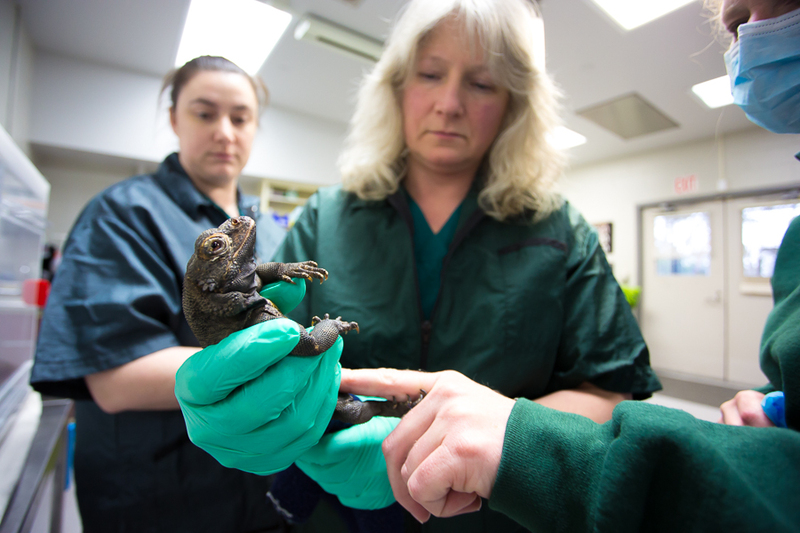 Jenny Pramuk, PhD, an animal curator and expert in reptiles and amphibians at Woodland Park Zoo, credits their unusually calm demeanor for inspiring many guests to adopt an especially compassionate perspective. Reptiles are often mischaracterized as having “reptile brains,” but in fact crocodiles are very smart animals. Here at Woodland Park Zoo, the two crocs have participated in a target training enrichment program for almost seven years. Keepers can ask the crocodiles to touch a target (in this case a long stick with a rubber ball on the end) and are then rewarded with a treat (usually a mouse). 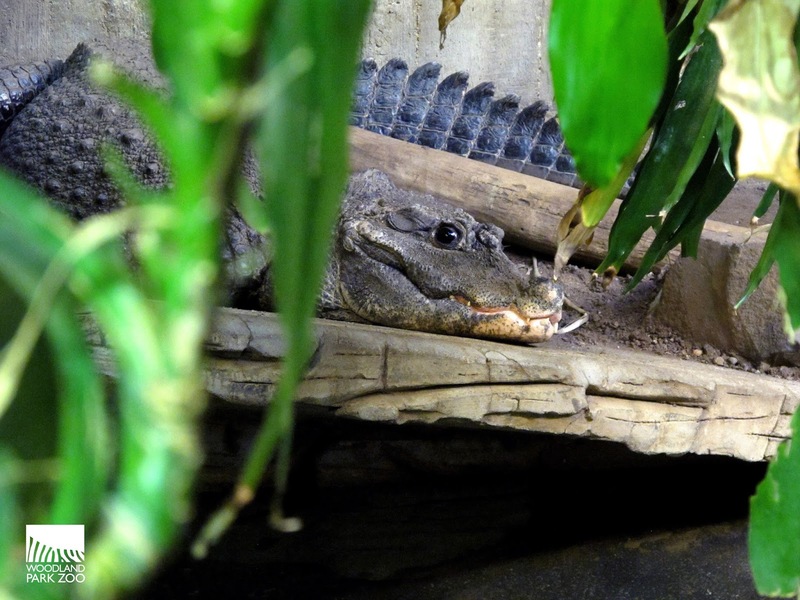 Jenny says our male croc is a little more food-motivated, so he really has the training down! Keepers were able to ask the crocs to move to specific areas of their exhibit for husbandry and cleaning access. 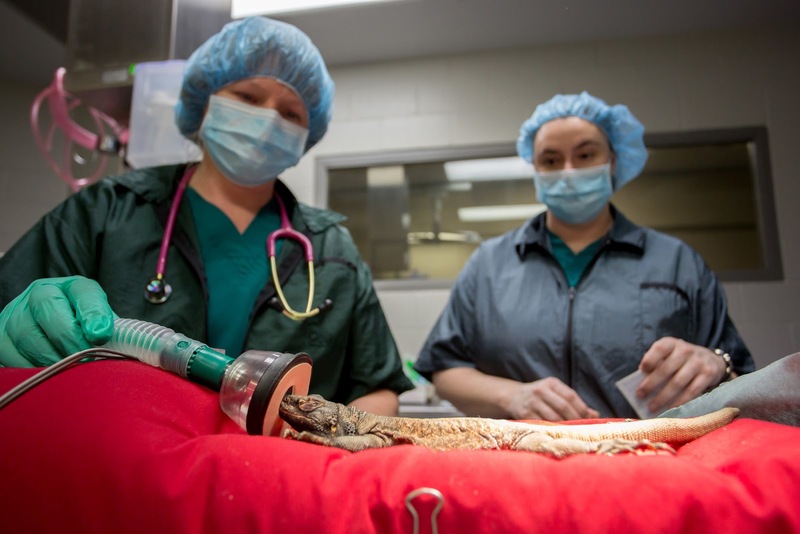 They were also able to walk them onto a scale and even able to voluntarily examine and apply medications to the male when he had a tail injury. Lead Keeper Alyssa Borek remembers, "My first impression was how relaxed the keepers were when entering their enclosure. 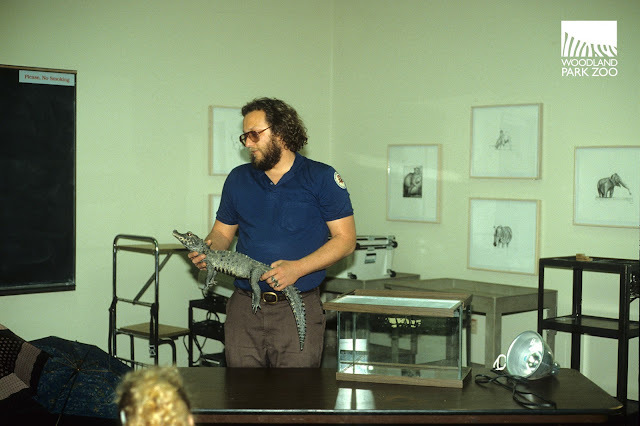 I had worked with much more aggressive, active species (such as Cuban crocodiles that are able to jump out of the water!) before coming here. I never imagined any crocodilian to be as mellow as this pair. It has been a pleasure working with them." Basking in the cozy grotto at the edge of the pool, our pair of crocs lived in the Day Exhibit at WPZ for over 44 years. Photo by Kirsten Pisto, Woodland Park Zoo. Lead Keeper Diane Yoshimi has worked with this pair of dwarf crocs for over 20 years. She remembers watching their babies hatch! She says, "I first started working with the dwarf crocodiles in the early 1980s. At that time, they lived in the turtle grotto with yellow-spotted side necked turtles, mata matas, a red-eared slider, a giant hill turtle, a green crested basilisk and finches that would fly from grotto to grotto. It made for a lively but geographically inaccurate exhibit." The crocodiles were moved into a separate grotto in 1988 following a small renovation. Diane also recalls working alongside the late Dana Payne, a fellow herper and passionate zookeeper who would later become reptile curator. Diane remembers Dana's enthusiasm for the species and just how much he loved the crocs. 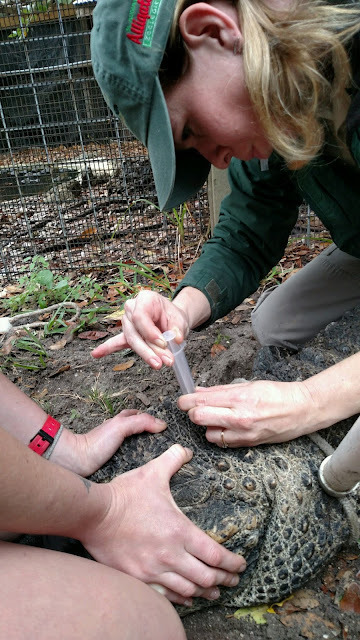 Dana Payne presents one of the juvenile dwarf croc offspring during an educational program. Photo from the Woodland Park Zoo archives. You may be asking then, why are we sending these crocodiles across the country? In mid December 2016, the zoo’s Night Exhibit caught fire. 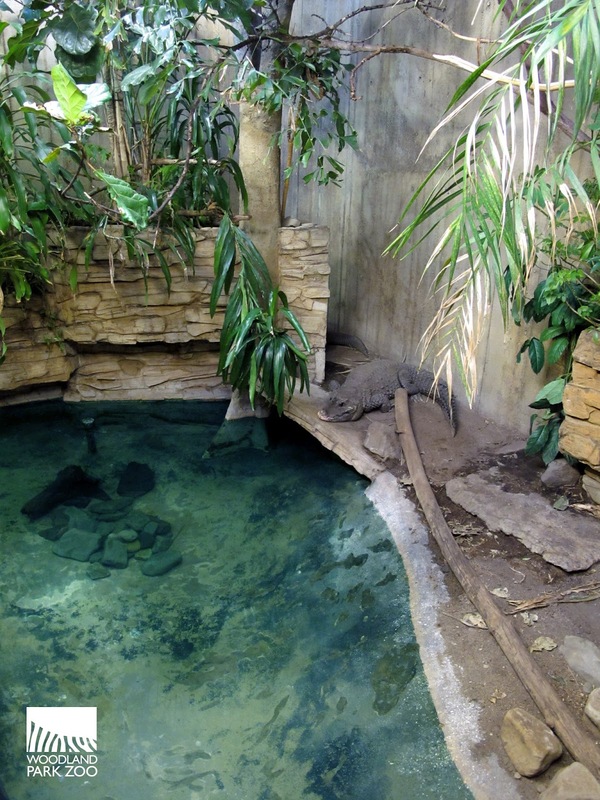 The crocodiles lived in the zoo’s Day and Night Exhibit building where the fire caused significant structural damage, including holes in the roof and collapsed internal structures. Because of our training and practice throughout the year, every team member was well prepared and organized, which allowed for an immediate emergency response. As smoke began to enter the spaces where many of the zoo’s reptiles and amphibians made their home, the animals were quickly evacuated. Keepers waded into the crocodile pool, in the dark, and were able to lift the pair to safety. Even as all of this commotion was going on, our crocodiles were as calm as ever. They waited patiently in the back of a warm van while keepers drove them to their temporary space at the Animal Health Complex. The pair hanging out in their temporary holding at the Animal Health Complex after the fire. A crocodile by any other name? Nope, our dwarf crocs may have earned some nicknames by visitors, but officially they have remained nameless for all these years. When you are as cool as our crocs, you don't need names! Photo by Alyssa Borek, Woodland Park Zoo. About 182 animals—reptiles, amphibians, and a couple of mammals—were safely rescued from the fire and relocated to other animal buildings on zoo grounds. The animals remain off public view except for a reticulated python which shares an exhibit with an Indian python in Trail of Vines. Since December 16, the crocodiles had been living together in the Animal Health Complex, with access to a small pool, special attention from our staff, and daily visits (and extra treats) from their keepers. While we worked to determine the next steps for all of the animals that made their home in the now empty Day Exhibit, we decided that because of their age and size, it was best that we find a more permanent housing solution for the dwarf crocodiles. "I’ll miss sitting in the office and listening to them vocalize, which they always did right before closing making it difficult to ask visitors to exit," says Yoshimi. "I used to tell visitors that since crocodiles have extremely long lives, I would one day be an elderly zoo visitor and look down at the same crocodiles from my wheelchair. I am very sorry to see them leave WPZ but am thankful that we were able to find a good home for them in Florida where they can live outside in the warm climate." The St. Augustine Alligator Farm is an AZA-accredited zoological park with a mission for education and conservation. 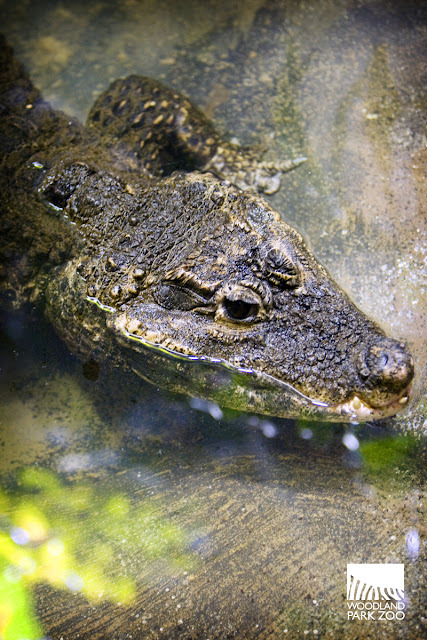 It is also the only facility in the world housing all 24 currently recognized species of crocodilian. In short, we are thrilled that St. Augustine was able to take our pair of dwarf crocs and give them a peaceful, state-of-the-art retirement. Our crocs are going to “the luxury resort of crocodiles,” says Pramuk. With facilities that include heated floors, warm bathing pools and sunny outdoor spaces, our crocodiles are going to retire in style, and we wouldn’t have it any other way. "I am sad to see them go, but given the circumstances, I think that St. Augustine Alligator farm is an amazing place for them" adds Borek. "They are renowned for their work with crocodiles, and even host the AZA Crocodilian Care and Biology training workshops every year. The crocs will live outdoors with natural sunlight and will benefit greatly from this! Florida is not a bad place for a crocodile to retire to!" The crocodiles traveled by way of Delta Airlines last Wednesday in temperature-controlled cargo and in specialized travel crates. Being the calm creatures that they are, curator Jenny Pramuk says the trip went smoothly. The crocs were loaded into their travel crates at the zoo and then driven straight to Delta's cargo loading for a speedy departure. Their dedicated keepers escorted them all the way to the gate. While they would have preferred an in-flight meal, Delta doesn’t have mice on the menu. After a four-hour layover in Atlanta, they arrived safely in Florida. First class crocs! 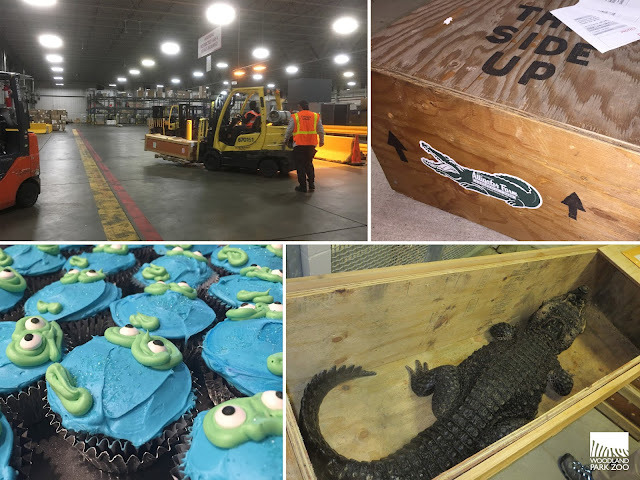 Clockwise from top right: the crates arrive from Florida, the crocodiles are placed in their travel crates, keepers eat crocodile cupcakes and say their goodbyes, the crocodiles arrive at Delta cargo for the flight to Florida. Photos by Kirsten Pisto, Alyssa Borek and Diane Yoshimi, Woodland Park Zoo. After a quick health check-up, the crocodiles were welcomed to their new home by the staff at St. Augustine. They've arrived! The staff at St. Augustine welcome the pair to Florida. Pictured here is the male. 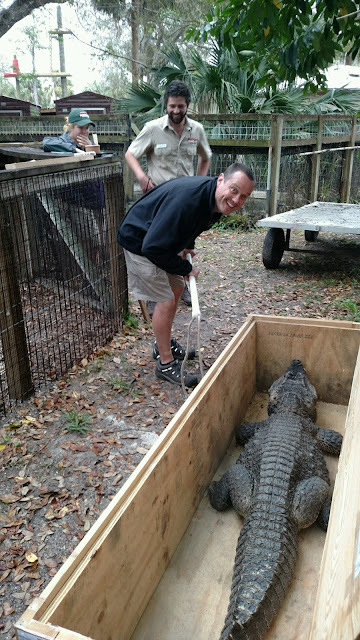 Photo courtesy of St. Augustine Alligator Farm. A quick blood draw for animal health records. Photo courtesy of St. Augustine Alligator Farm. 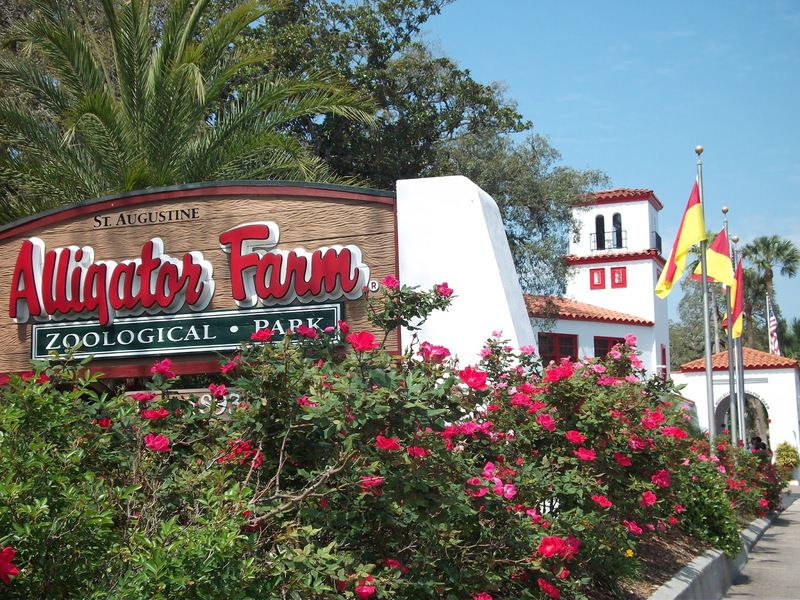 Jim Darlington, curator of reptiles at the St. Augustine Alligator Farm, says the crocodiles will live together in an outdoor grotto complete with crocodile comforts. Their temporary enclosure features flowing artesian well water that leads to a comfortable pool for two and plenty of sand for basking in Florida’s warm sunshine. “Future plans have this impressive pair moving to their very own larger habitat where visitors can experience our newest crocodiles. 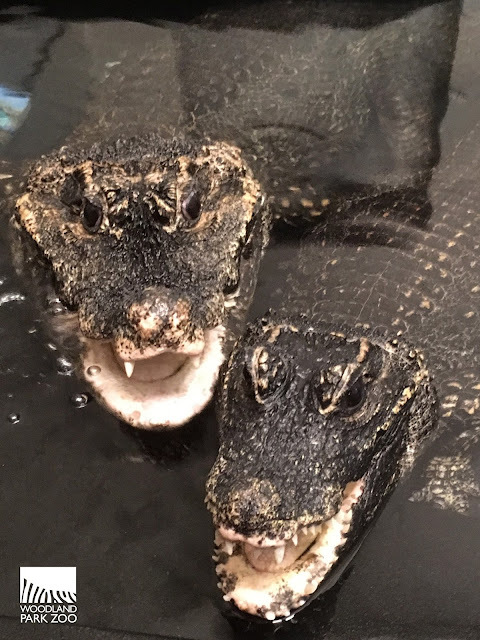 At the St. Augustine Alligator Farm, this pair will proudly represent its ancient species in the only complete collection of all 24 species of living crocodilians to be viewable by the public,” says Darlington. In their new home, the pair will remain together but separated from other crocodiles, since they are used to living on their own. Already exploring the grounds in holding after exiting the travel crate. 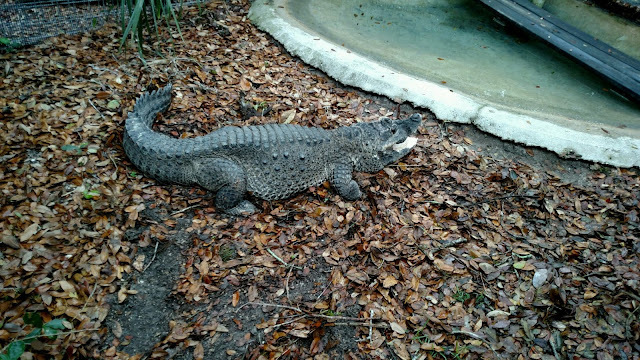 Photo courtesy of St. Augustine Alligator Farm. Both buildings remain unsafe to access and the Seattle Fire Investigation Unit has not been able to determine the cause of the fire. The zoo continues to be involved in numerous inspections, evaluation efforts, and conversations with fire, city and insurance personnel. The damage is being assessed, including the structure and mechanical and electrical systems. Re-occupation of the Day Exhibit side of the building will depend on damage assessment to the entire building and strategies to replace all of the utilities. Since the rescued animals were relocated to other buildings at the zoo, Pramuk reports that some animals have been busy breeding and reproducing. Among the new offspring are: 50 tiger-legged monkey frogs—a first-time breeding at the zoo for this species; four shield-tailed agamas (lizards found in Somalia and Ethiopia); 12 axolotls (Mexican salamanders); five Burmese vine snakes; and two Asian yellow-margined box turtle eggs expected to hatch in March. Dwarf crocodiles (Osteolaemus tetraspis) are found in the tropical rivers and swamps of sub-Saharan West Africa and West Central Africa. They thrive in swamps and rain forest rivers, but have also been found in savanna flood zones where they soak up the extra moisture during the wet season, and dig burrows in heavy mud to aestivate during the subsequent dry season. Like most of the 24 species of crocodiles, both dwarf crocodile subspecies are endangered due to over hunting, persecution and habitat deconstruction. Photo by Mat Hayward, Woodland Park Zoo. Very special thanks to Jenny, Diane, Alyssa and Peter for taking extra special care of our crocodiles and safely sending them off to their new home. Last night during the Thrive Leadership Awards dinner and fundraiser, Woodland Park Zoo honored individuals and a family business who have demonstrated their commitment to protecting wildlife and the environment around them, and advancing the zoo's conservation mission. Rodrigo Medellín (AKA The Bat Man!) with Woodland Park Zoo President and CEO, Alejandro Grajal. 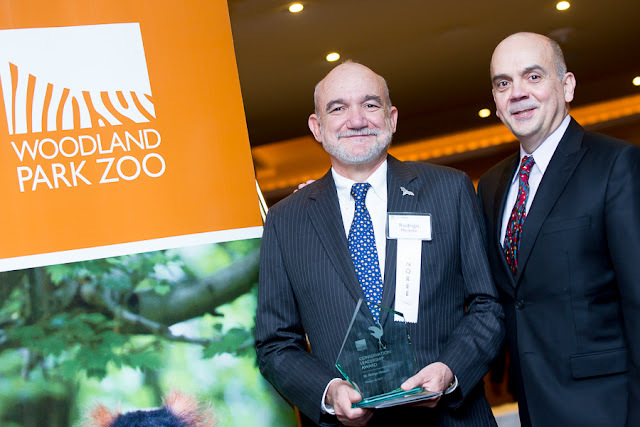 Conservation Leadership Award: Rodrigo Medellín, PhD, for his dedication to the study and conservation of bats and other mammals. Known as the “Bat Man of Mexico,” Medellín’s tireless research and work with farmers is restoring the population of Mexico’s lesser long-nosed bat, which pollinates the blue agave—the single plant species tequila is produced from. Bat-friendly tequilas and mezcals are saving bat species while revolutionizing Mexico’s tequila industry. 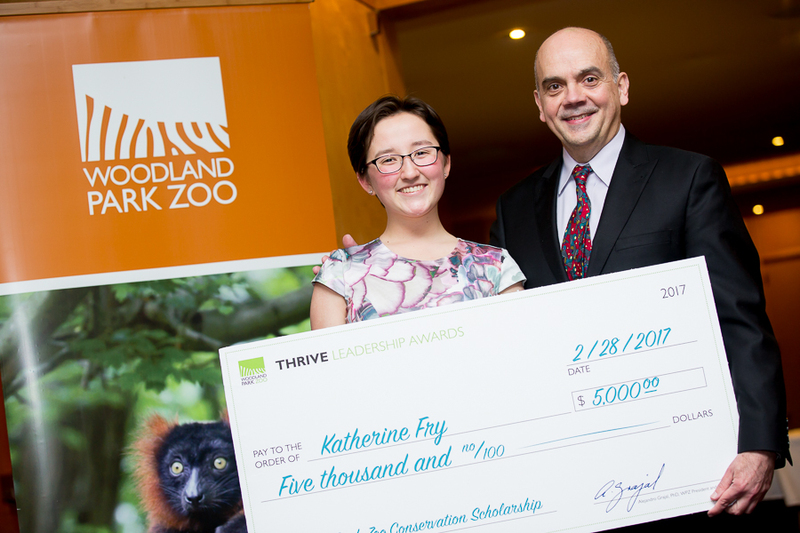 Woodland Park Zoo was honored to surprise Katherine with a scholarship in recognition of her outstanding leadership at the zoo as well as a little boost to her promising studies and career. We are grateful to our board member Rob Short and his wife Emer Dooley for underwriting this award. Not only has the zoo inspired Katherine and her aspirations, but she has in turn inspired dozens of her peers and thousands of visitors whom she’s touched. Congratulations! Youth Conservation Award and $5,000 scholarship: Katherine Fry, a senior at Chief Sealth International High School, for contributing nearly 800 hours of volunteer service and providing leadership in the zoo’s youth programs including ZooCorps, Seattle Youth Climate Action Network and Citizen Science Amphibian Monitoring. In the fall, Fry will begin undergraduate study at Western Washington University to study environmental science and biology. Keem and Denali thank Brown Bear Car Wash for their support! Guy. 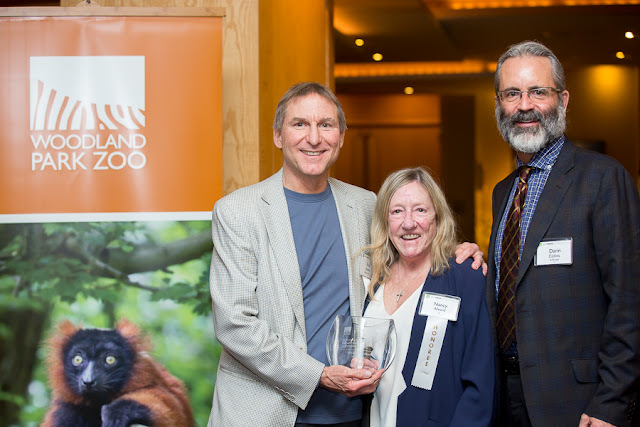 C. Phinney Corporate Leadership Award: Brown Bear Car Wash and owners Odermat Family, who for more than two decades have supported Woodland Park Zoo through their generosity and leadership action. As a family business, Vic and Mary Odermat have made it a priority to have their whole family involved in connecting people to nature and being a voice and advocate for conservation. Rick and Nancy Alvord with Dr. Darin Collins, director of animal health at Woodland Park Zoo. Outstanding Philanthropic Leadership Award: Rick and Nancy Alvord, a couple who has been a part of Woodland Park Zoo’s community for 32 years—giving so big-heartedly of their resources, time and leadership to help the zoo expand its role as a conservation and education institution. True believers in giving back to their community, they have passed this value on to their own children and grandchildren, creating a legacy of compassion for wildlife and the environment. “These exemplary leaders are accomplishing extraordinary things to change the lives of animals, change the lives of people and change the world. This is what Woodland Park Zoo’s exciting and engaging future is all about,” said Woodland Park Zoo Board Chair Jeff Leppo. Funds raised at the Thrive Leadership Awards dinner will support Woodland Park Zoo’s exemplary animal care program, wildlife conservation projects in the Pacific Northwest and around the world, hands-on environmental learning for all ages, and action-centered programs that engage communities in protecting wildlife and living landscapes. Thank you to all of our conservation heroes, as well as you, our members and visitors, who are a force for nature every time you visit the zoo.